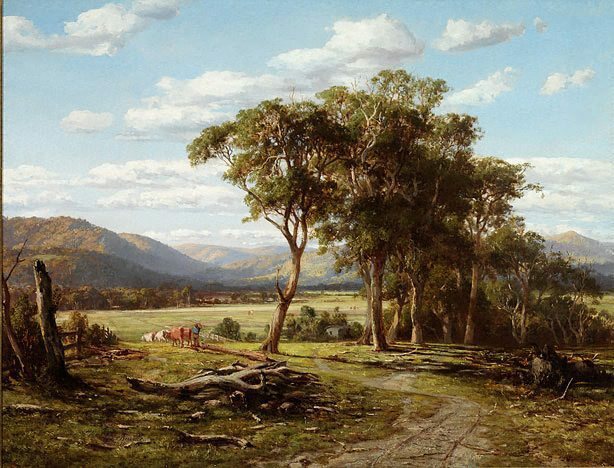 An established photographer, painter and lithographer, Louis Buvelot arrived in Melbourne in 1865 and quickly found buyers for his tranquil pastoral scenes, inspired by Dutch 17th-century landscape painting and the French Barbizon school. Finding subjects in the environs of Melbourne, he led sketching tours with fellow plein-air painters Frederick McCubbin and John Ford Paterson. 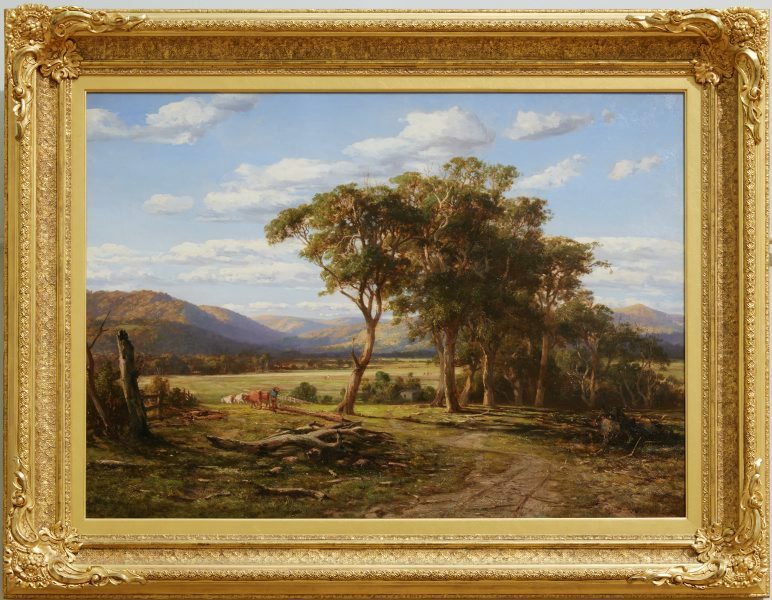 'At Lilydale' depicts one of the artist’s favourite painting spots near the Yarra Valley, and is imbued with a gentle serenity in which nature and man are, seemingly, in perfect harmony. 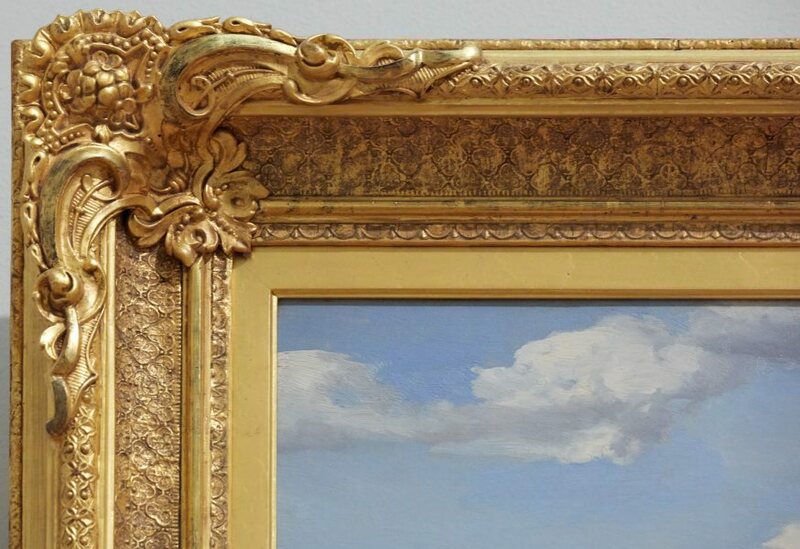 This original frame is attributed to the prominent 19th-century Melbourne workshop of Isaac Whitehead. Signed and dated l.l., brown oil "L.Buvelot./ 1870". Bruce James, Art Gallery of New South Wales handbook , 'Australian Collection: Painting and Sculpture', pg. 102-181, Sydney, 1999, 108 (colour illus.). Vivienne Webb, Australian art: in the Art Gallery of New South Wales , 'Golden age', pg. 37-38, Sydney, 2000, 40 (colour illus. ), 300. Art is ... making, creating and appreciating 2 , Milton, 1999, 217 (colour illus.). AGNSW Collections , 'From Colonialism to late Modernism', pg. 7-106, Sydney, 1994, 12 (colour illus. ).